CANTON, Mass. 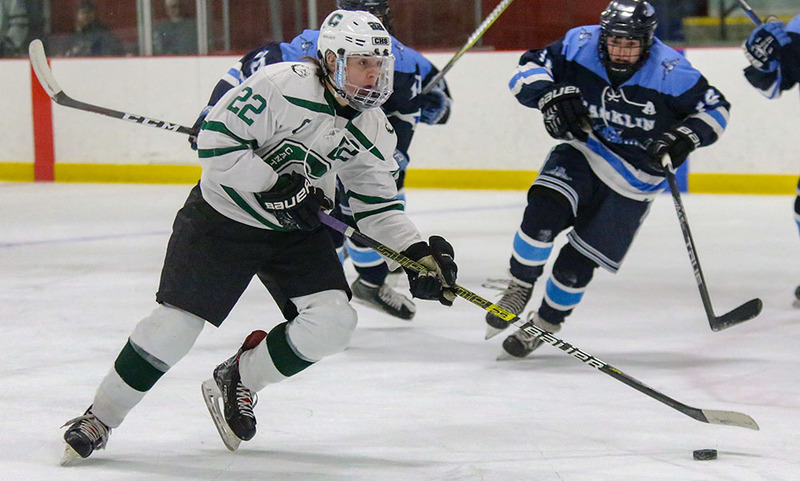 – There’s 15 minutes in each period, and the Canton boys hockey team made sure to use every second of each one. 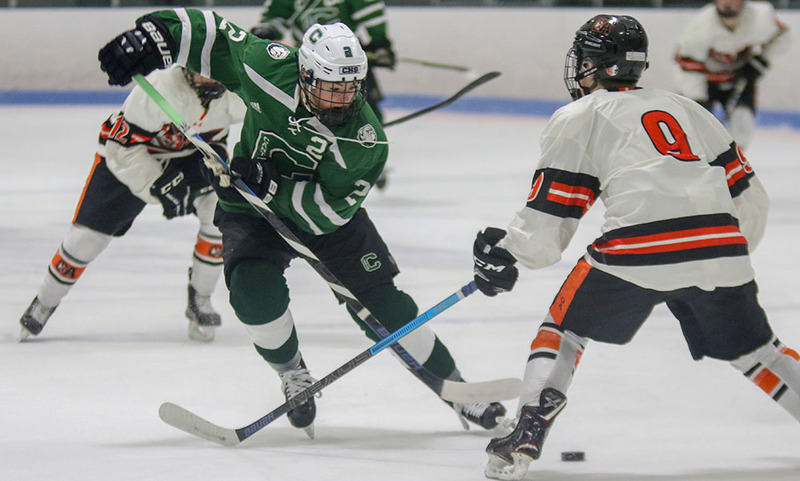 The Bulldogs scored with less than five seconds left in each the first and second periods, both on the power play, to pick up a 3-1 win over Franklin in a non-league clash between Hockomock hockey powers. Franklin took the lead less than a minute into the contest but Canton equalized less than four minutes later. Panther senior defenseman Matt D’Ericco had a puck pop out to him in the attacking zone and fired a low shot that deflected off a skate and into the net just 54 seconds in to the game. Canton senior Ryan Nolte answered less than four minutes later to bring the hosts level. Nolte made a nice move to get around a defenseman and released a shot right in front that was partially saved by Franklin goalie Ryan Cameron (25 saves), but the puck trickled over the line to make it 1-1. The teams traded chances over the final 10 minutes, with Franklin junior Colin Hedvig forcing Canton senior goalie Michael Staffiere (18 saves) into a tough save. Two minutes later Canton junior Tommy Ghostlaw came flying down the left wing, drew the defense, and centered a pass for Ciffolillo but his one-timer went off the post and stayed out. Just when it looked like the teams would head to the locker room level, Nolte drew a tripping call in the attacking zone with 33.9 to play. After an attacking face off, the puck squirted free to Owen Lehane at the blue line. Lehane quickly passed to his left to junior Jack Connolly, who quickly one-timed a shot in front of goal. Junior Chris Lavoie was positioned all alone in front, made one move and stuffed his bid in with 2.7 left in the period. Despite the late goal in the first, Franklin came out reenergized in the second and controlled the majority of the period. Franklin senior Joey Lizotte forced a nice save from Staffiere and the rebound bid from CJ Spillanee hit off the post and stayed out. Tom Tasker drew a tripping call with eight minutes to go, and the Panthers even had 5-on-3 for 14 seconds after a cross check, but Franklin was unable to solve Staffiere again during the two-man advantage opportunities. The best chance came on the stick of Lizotte, who beat a defenseman with speed and rifled a shot on net but Staffiere turned the bid aside to keep the lead. Despite controlling the period and having the majority of possession, Franklin wasn’t able to cash in and took a penalty with 1:38 to go. Canton once again took advantage of a late man-up chance. As the final seconds ticked away, Ghostlaw blocked a clearance attempt, Connolly jumped on the loose puck and dumped it in front of net, and junior Shane Marshall settled the puck and fired a backhand attempt with Lavoie screening in front. The shot hit the back of the net with under a second to play, just a moment before the buzzer sounded for the end of the second period. “I thought we carried the play in the second, we outshot them, we had more opportunities,” Spillane said. “We actually forechecked and turned pucks over, we did what we needed to do. But that’s a backbreaker with 0.2 seconds left, it was a legit goal no question about it. We had two guys fan on it, that puck shouldn’t have been anywhere near the net. A lot of little mistakes turned into a very lopsided game, 3-1 doesn’t even indicate what that game was like. Franklin had a pair of early chances to get back into the game but Canton’s penalty kill wouldn’t allow it. The Panthers had 38 seconds of 5-on-3 but didn’t register any significant chances. Hedvig fired a pair of shots on the man advantage, but both were stopped by Staffiere. Canton had two chances at the midway point as Matt Martin had a shot deflected just wide by Ryan Colby, and just a minute later, Nolte had his chance denied and Lavoie nearly snuck the rebound in by Cameron made the stop. Canton boys hockey (3-0) doesn’t hit the ice for another game for over a week, hosting Westwood on December 29th. Franklin (1-1) is back in action on Saturday when it goes on the road to take on Newburyport.